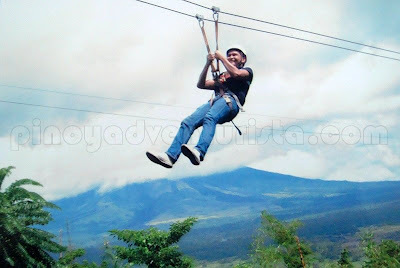 Aside from the spectacular and majestic view of the Mayon Volcano that Ligñon Hill offers, there are various fun-filled and thrilling outdoor activities that can be done here. One is the zip line which I promised myself to do if I will be given the chance to visit Legazpi City again. 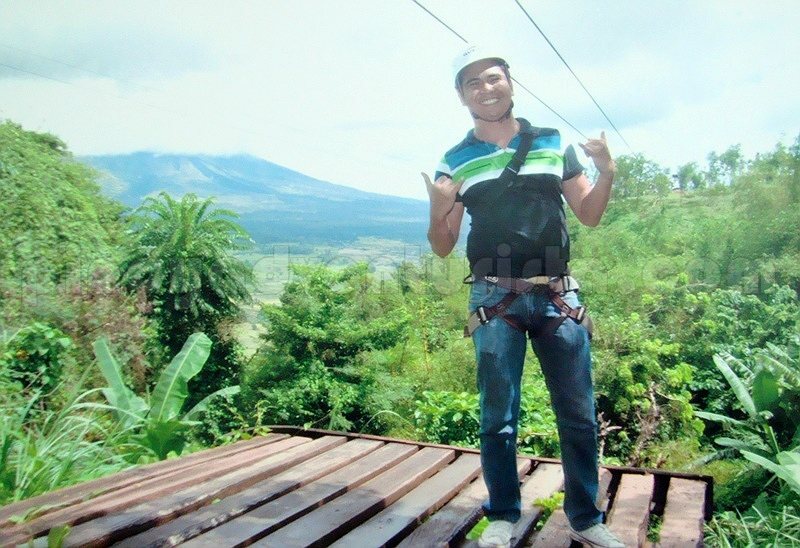 I finally had the chance to ride Ligñon Hill's zip line on my 2nd visit to City last September 15, 2011. Regardless of the gloomy weather, I am just so excited and ready to try it out. I believe that riding a Zip line is a test of one's bravery as you put your life in line by sliding through a cable wire. The park's zip line rises at 160 meters from the ground and around 360 meters long (combined). Back and forth ride costs PHP 200 which affords a stunning view of the Mayon Volcano. 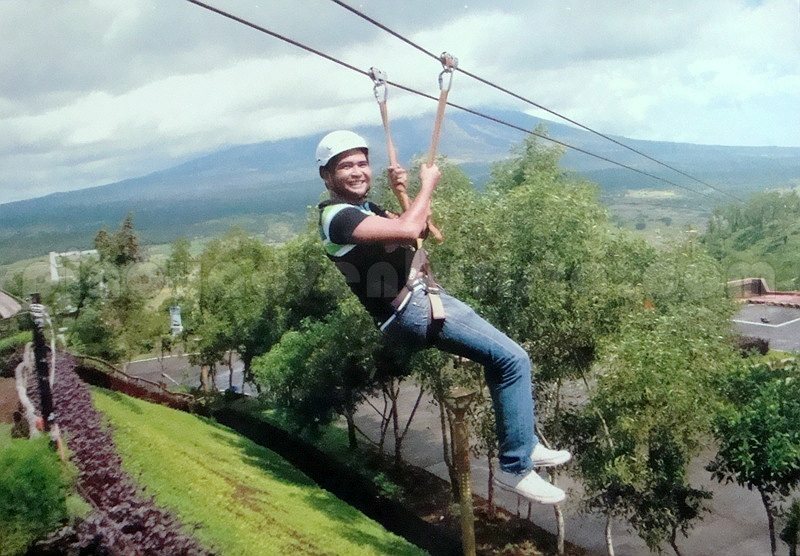 It is quite short compared to my previous zip line experiences in Tagaytay Ridge and at Dahilayan Adventure Park, but still it was a thrilling experience! Adventure junkies will really have a time of their lives here as they slide down the cable with the spectacular view of the Mayon Volcano. Too bad, Mayon didn't showed up! Hehehe! 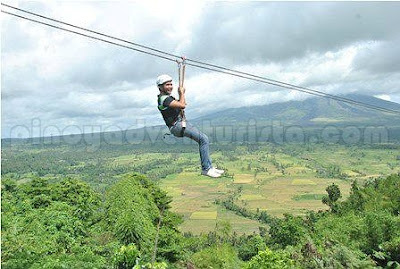 I highly recommend this for first-timers as it is a very easy ride compared to other zip lines in the country. It's an exhilarating experience! Believe me, you wouldn't know how enjoyable it is unless you try, right? Note: The zip line fee of 200 pesos includes 1 printed photo from their official photographer. Extra photo is at 50 pesos each. Tweet: @adventuristaako : I just did the 360m zipline in Ligñon Hill.. Wahhhaha! buti at meron na rin diyan sa lignon. dagdag activity pagkatapos umakyat. We tried ziplining here at night when Mayon was having tantrums, it was a bit crowded because it was over the Christmas holidays and there were media men covering Mayon's eruption. I've run up to Lignon Hill a few years ago together with police recruits. There was no zipline yet. This must be a recent development. @dong ho - yeah, it's an added attraction sa pag akyat ng ligñon hill... thanks Dom! @lakwatsera de primera - I've been to the city for 3 times already, ironically, never pa ako nag spend ng gabi dyan... hehehe!!! Thanks Claire!